The Music Engraving Tips group on Facebook recently featured an engraving challenge for replicating this score. Here is our result created from scratch in just 20 minutes starting with Finale's default document. 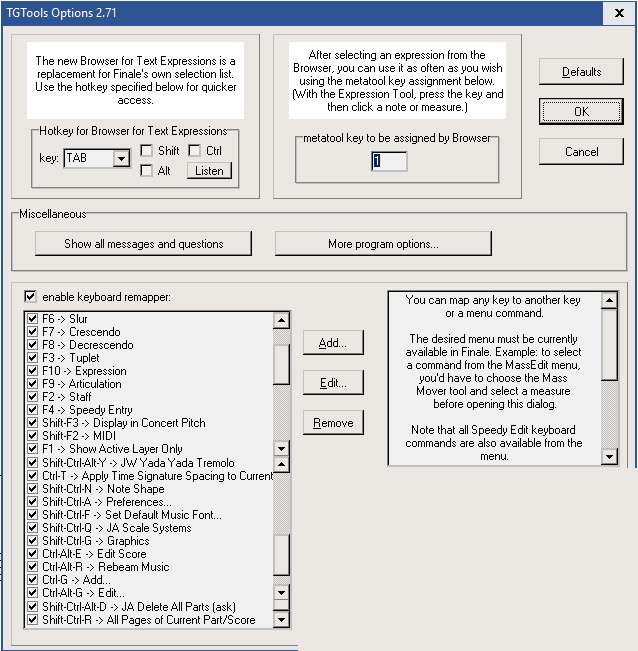 (You must have the free fonts Gonville, GnvilFIN and Tex Gyre Schola and their FAN files installed in Finale for editing the document). -Elbsound.studio's Perfect Layout for optimizing all other layout issues (not available yet to the public, beta test only). -Elbsound.studio's House Style for changing the style of the score (not available yet). -Elbsound.studio's Scale Systems for scaling the page and staff systems to an optimal size (not available yet). -JW Lua for running the Elbsound.studio plugins. -TGTools Compress Spacing for compressing the spacing of the 7-tuplet. -TGTools Keyboard Remapper for quick access to the main Finale tools (see screenshot below for my setup). -The document uses Lilypond's free Gonville font for the musical symbols (and the Elbsound font GnvilFIN for the rest symbols) and the free TeX Gyre Schola for text. Normally I also use a Logitech G13 for more complex Finale operations (especially parts layout, edit filter automation and playback muting), but it was not necessary here. - Vln.1/Vln.2 usually have a group bracket by default. But Finale is a bit inconsistent here: why do the clarinet/bass clarinet and bassoon/contrabassoons don't have a group bracket by default. - the spacing of the 7-tuplet in measure 2 still doesn't look quite convincing: the last space is much too small and the other spaces are too different. Probably I clicked too often on "Compress spacing". - the single piano staff doesn't have a group bracket anymore. I prefer this look. To have the bracket visible, go to Edit Group and check "Show bracket if group contains only one staff"
- the top tuplet brackets in measure 4/oboe could be shifted slightly closer to the staff. The plugins also have prepared the linked parts in the background. This is how the first horn part currently looks - i.e. 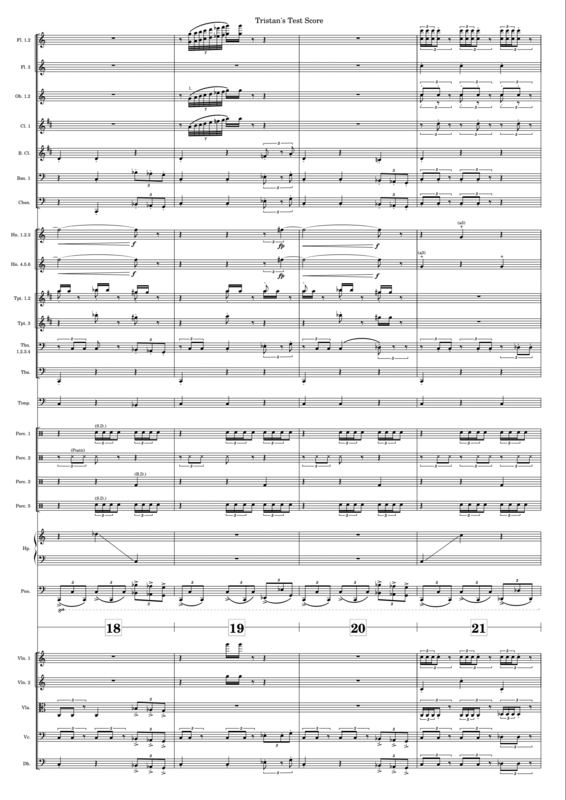 the layout optimizations have been performed for printing, but the part names need to be edited and multiple voice staves - like the oboes - need to be split with the parts manager. Image 2: How do the parts look after 20 minutes? 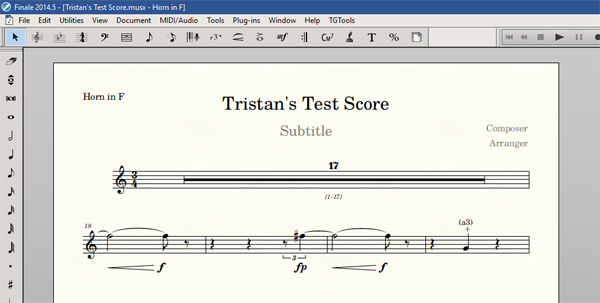 Here is a video of the same score page created live in Sibelius (great job, Justin!). And here is an image of the page created in Lilypond.